The semi-long coat of the Stabyhoun is self-cleaning. This means that dirt falls off by itself when it is dry; one brush through it to remove the last remnants of sand and it is clean again. He only rarely needs a bath. Even if he really is very dirty, just a rinse or a swim in a clean pool is usually sufficient. Shampoo is only required if he has been rolling in something smelly; then use a special, neutral dog shampoo so as not to disturb the skin oils. A healthy dog has, by definition, a beautiful, shiny coat. The coat does not often require brushing, except during the moulting period (2x per year) when the undercoat is released. Every other day brushing is then necessary. Always keep at least the hair behind the ears and on the pants tangle free. Some dogs shed year round, it is said that the warm climate is to blame and that a coat needs the cold to stay beautiful and healthy. Therefore, set the thermostat down at night for sleeping. Stabys like a cool (draft-free) space. A Staby basically does not need to be groomed. Any necessary trimming you can very well do yourself, unless your dog is neutered. With this often comes what is called a "castrated" coat, where the undercoat is exploding (this may also be true with females). 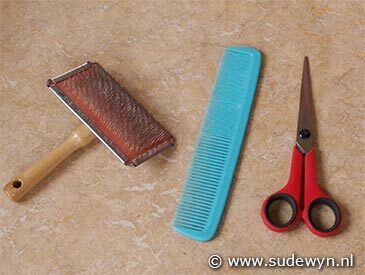 There are all kinds of luxury and expensive hair care products on the market, but all you really need is a universal brush, a comb, scissors and some skill. Often dogs prefer a simple plastic comb, because the teeth seem more pleasant than that of a metal comb. Start by brushing the fur with a universal brush. Make sure all the tangles are out of the coat. 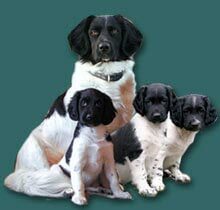 The breed standard says the bottom third of the ears should be short haired. Often that is true, but that is hidden from view by overhanging longer hair from the upper part of the ears. This can be corrected by plucking the long and discolored fur, as below. The top coat on the ears is too long and is already brown. It disturbs the facial expression and gives a messy look. It also tangles easily which can be painful. Here the excess old, brown hair has been plucked. You again see that the lower part of the ear actually has short hairs, as correct in the breed standard. Behind the ear thick clumps of old fur can be seen when sunlight falls over the brown color. You had better pluck here because it is quickly tangling. Plucking is described below. Hold the hair at the base of the ear with one hand and pull the brown hair out with the other hand, bit by bit. If you take small tufts at a time, it does not hurt because the hair shaft is already dead and loose. The hair should be cut in the winter because otherwise salt brine or snow may linger, which can be painful for the dog. The hair between the toes grows, but should be kept short. of the foot and the toes. Now we are going to tackle the blades of fur stabbing out on top between the toes. On the last picture above, you can see that part is still sloppy. Comb the hair between the toes and spread it up. While keeping it fixed, cut the fur from the tip of the nail with a curve in so that all hairs are about as long. On the rear feet, the hair is trimmed to the right heel. Comb against the grain in order to get everything right. On the front feet, the hair is trimmed to the right wrist pad. The fur on the ears, collar, trousers and tail of a Staby is not cut with scissors!